If you follow me on Pintrest you will know that I have been obsessed this past week with finishing my orange and brown quilt top. I got a bee in my bonnet and could not let it go, even though I had other pressing quilts with deadlines. The quilt started life some months ago as this simple block – you can find the free paper piecing pattern link on my original post. 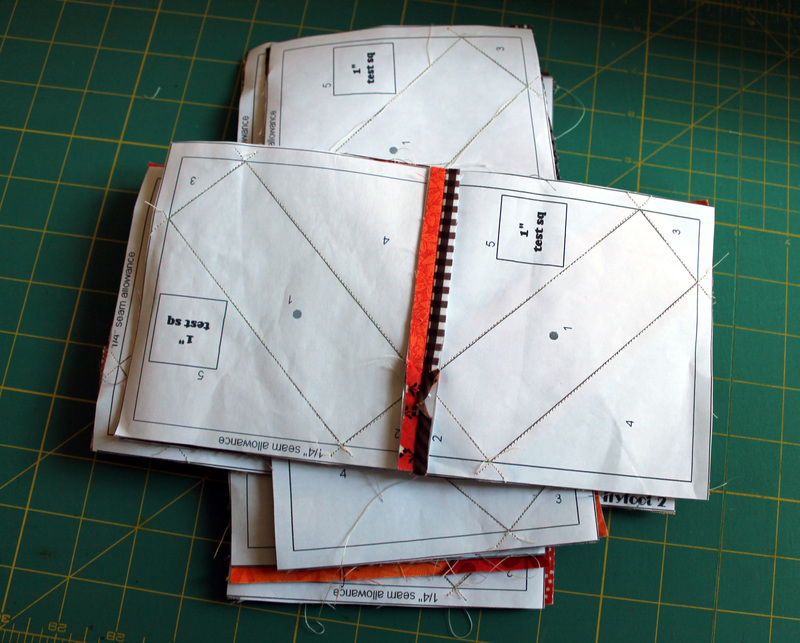 So over the last week I have feverishly been making blocks….sew, iron, trim repeat. 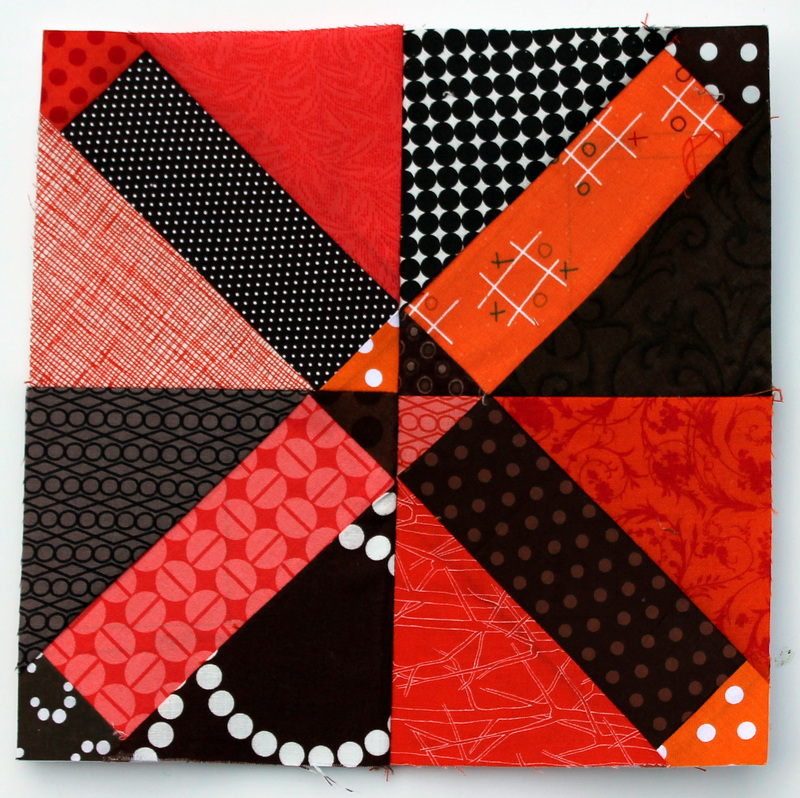 I love the meta pattern this block creates…and I extra love the scrappy feel to the quilt. The splashes of white and the variation in the tones of both the orange and brown make the top really sing. The paper pattern makes for pretty accurate piecing so that there is a lovely crispness to the points and joins. Now all I have to do is rip the paper off, baste, quilt and bind it. I already have a backing fabric chosen and have a name picked out. 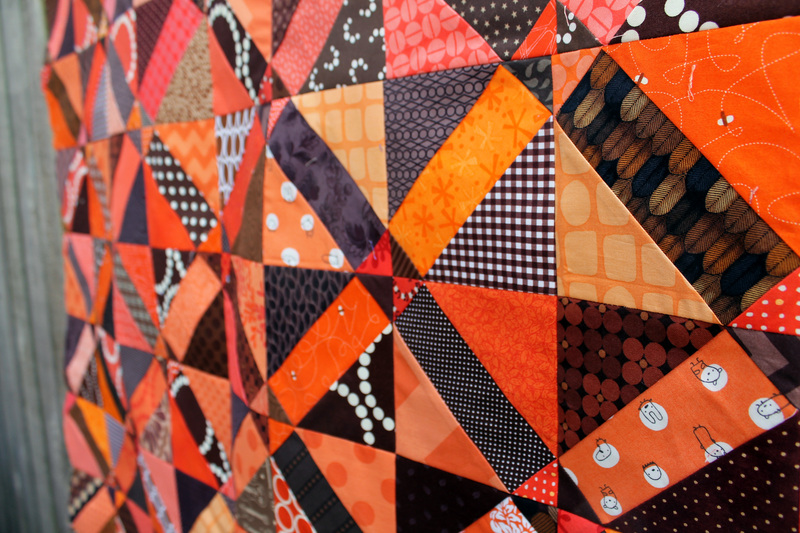 This is my Jaffa quilt.. .named after a fabulous Aussie chocolate orange lolly/sweet/candy. Thanks. There is a little orange/red in there. It is the best way to get a dark orange without it being to muddy or dirty a colour. EEEE this is so beautiful! I love the contrast between the oranges and the deep browns! Absolutely stunning. Thanks. The colours are a little out of my comfort zone….namely the brown but I am pleased with how it turned out. I had forgotten about movie isle Jaffa rolling. That takes me back…that and picking up melted Jaffas and getting really stained hands. This is just wonderful! I love the colors and can see why you were excited to get it pieced! There are some really great fabrics in there. Gorgeous, but so non-Wombat I had to double check it was one of your posts. The Pearl Bracelets gave it away… You are a machine! Not only immaculate paper piecing but chain piecing too. And remember getting a scary orange and brown tongue if you hold a Jaffa in your mouth and let it melt? It is so beautiful. I also really like the variety in the values. I don’t see that many quilts that use brown and when they do, it’s often muddy. Yours steers so far beyond that, it almost sparkles with those tones. Wonderful job. 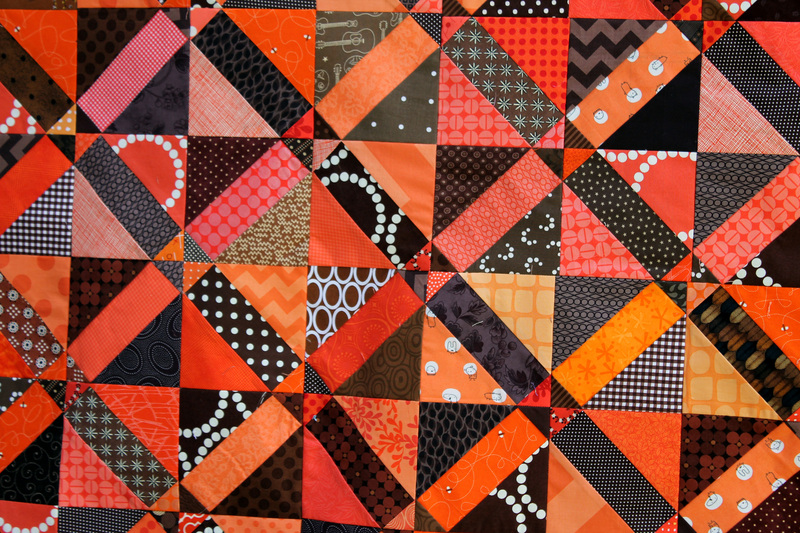 This makes me reconsider doing a non-Halloween Halloween orange quilt. What a wonderful colour combination, and Jaffa’s were one of my favourite treats. 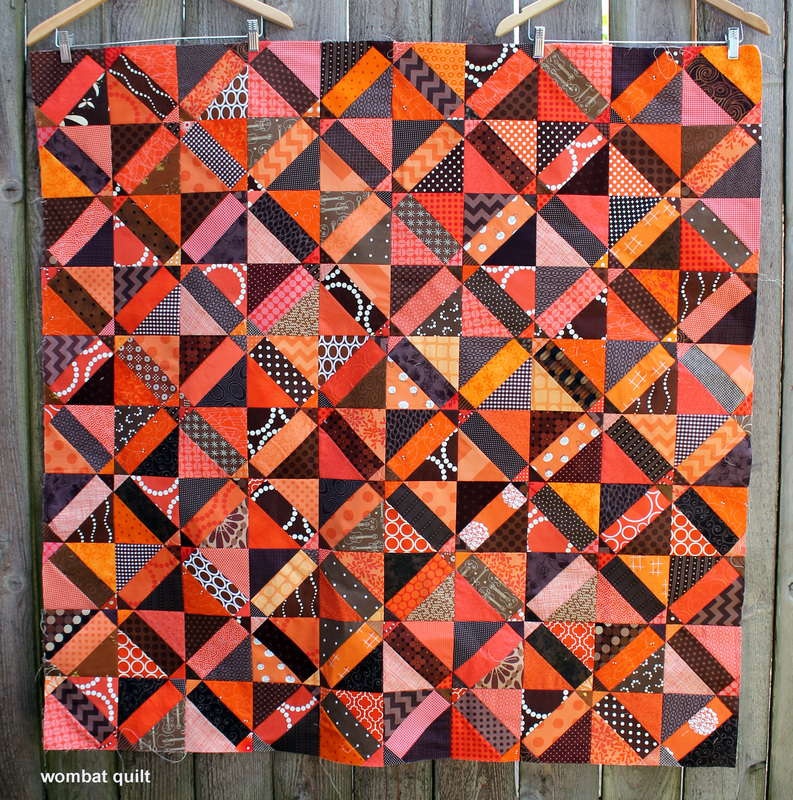 love this quilt and the colour combo is awesome – I’ve always loved orange and brown and still love jaffas !! wow! That is just spectacular! The color combination can sometimes be dull but yours is quite the opposite! And the paper pieced pattern really does add a nice sharp distinction to the quilt! Lovely! I am so LOST here in USA with the reference to JAFFA’s…but I do love some nice orange Candy Corn at Halloween ! The quilt is wonderful. I was examining the pattern, not realizing you had paper pieced it. What a task getting all that paper off. I love the quilt. I have a secret weapon when it comes to taking the paper off my quilts… My husband. I have trained him in the art of removing paper gently and he is quite proficient. It helps immensely. Love the colors and the awesome design it creates! awesome! That is fantastic! I bet you have to keep coming back to look at it, I know I would be! Super work, well done. Wow, it’s amazing! Such great contrast. Love that pattern and I’m going to use it at some stage for sure. It couldn’t be any more Jaffa! Love it! The colors are perfect together! Hot! watch that the chocolate doesnt run! Great contrast. Oh I hope the chocolate does not run…..cold wash with some Colour Catchers should do the trick. Lol. It’s a stunner! love the colors you’ve used. Great idea. I have lots of fabric, but not necessarily such a wide variation in single colors. Barbara my solution is to raid friends scrap bins and buy a few select 1/4 yard cuts. There are tons of repeats in this quilt and it would work with only a handful of fabrics just as well. Oh I had not thought of that but you are right. I may steal your idea. Love this color combo, great job. Love this so much! What a wonderful quilt! Oh, and by the by–I’m starting to see Jaffa in the US. I lived in England for several years, so I’m already to familiar with it. A few years ago I found Jaffas at a Cost Plus World Market here in the US but most of the time I have my family ship them in in care packages. i can’t get over how much i love this. it’s totally unexpected and beautiful. i usually shy away from brown and now i want to break them out! this is gorgeous, as usual, cath! i love it! You are so fast!! Love it!! Yum! Jaffas! It looks great. I LOVE it- and that’s saying a lot since orange and brown are not normally colors I enjoy. but, oh, you may have changed my mind with this one!! You have the most amazing knack for picking a block that looks like nothing special on its own, and absolutely fantastic next to others of the same construction. This is a gorgeous quilt. Thanks Suzanna. I am not sure how I do it but it is so much fun to try different things and play around. Lovely quilt with great color combinations.